Look for the 2014 Spring Break Guide at Your College Campus January 17th! Look for the 2014 Edition of the Spring Break Guide January 17th! (January 14, 2014) Wheaton, IL – College students throughout North America will once again be able to rely on the Spring Break Guide for making their 2014 Spring Break plans. The annually released publication, which has kept college students in the know about Spring Break destinations and events for more than two decades, is known to be a significant Spring Break resource and is an anticipated fixture among college campuses throughout the United States and Canada. The January 17th release will mark the 22nd edition. Published and distributed by Collegiate Marketing Group (CMG), the Spring Break Guide promotes key break destinations, including Panama City Beach, FL, South Padre Island, TX, Daytona Beach, FL, and Myrtle and North Myrtle Beach, SC. 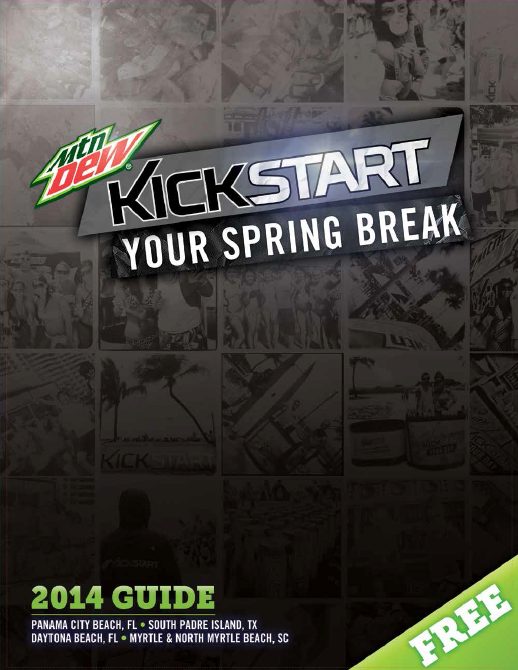 The 2014 edition features a new cover sponsor, with Pepsi’s Mountain Dew brand ‘Kickstart’ becoming just the second beverage brand sponsor in the Spring Break Guide’s history. (Coca-Cola was formerly the featured annual sponsor). The 2014 Spring Break Guide will be distributed throughout 25 U.S. states, as well as in Canada, at over 200 school campuses, fraternity/sorority houses, and other related distribution hubs. Its overall reach is projected at one million students when factoring in digital downloads and social media targeting. As a companion to the printed magazine, the online version at springbreakguide.com gives advertisers extra exposure, allowing students to click on sponsors’ websites and read up-to-date news and information concerning the featured destinations. CMG is a full service marketing and communications agency with a proud specialty in promoting leisure and lifestyle brands that specifically target the student market. For more information, please visit www.cmgmediaagency.com. Download the digital version of the 2014 Spring Break Guide right here and join the discussion on Facebook and Twitter! For future advertising information, please contact CMG Media Agency.